Chef Sarah in Austin Woman Magazine! Through local sourcing and waste reduction, Foreign & Domestic Co-owner Sarah Heard crafts Texas-rooted, sustainably focused and delicious plates. It’s a quiet weekday morning at Foreign & Domestic, a petite, sustainably minded American eatery situated in a former skateboard shop on North Loop. The restaurant doesn’t open until dinnertime, but Sarah Heard, co-executive chef and co-owner, just finished placing Mason jars filled with bright, simple blossoms on all the tables and windowsills. The flowers are a new addition since Heard and her business partner (and life partner), Nathan Lemley, bought the restaurant a little more than a year ago. After more than a dozen years of cooking in Austin, Heard now inhabits three-quarters of an acre of land in Luling, Texas, where she forages for prickly pear cactus, wild onions and mustang grapes alongside her persimmon and peach trees. The Texas native loves incorporating lesser-known state ingredients into the eatery’s thoughtful, locally rooted plates. 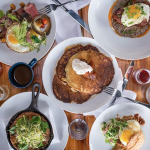 Foreign & Domestic’s diner-style, open-concept kitchen allows guests to see every step in the preparation of the restaurant’s simple, elegant helpings. Behind the scenes, Heard maintains a coordinated effort to shop locally and reduce waste. Heard and Lemley, who have been together for almost four years, focus on supporting small farms that practice sustainable agriculture, as well as humane slaughtering. Heard tends an herb garden on the restaurant’s patio. Every day, she hauls buckets and boxes of food scraps home from work to compost and feed her animals. Additionally, Foreign & Domestic’s menu shifts with the seasons, sometimes adjusting as often as twice a week. For fall, Heard is most inspired by fresh offerings like bitter greens, squash and tomatoes. Home cooks can imitate her intentions by focusing on Texas-based products, shopping at farmers markets and choosing locally sourced food subscriptions like Johnson’s Backyard Garden and Lettuce. 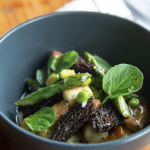 When dining out, the rising chef especially admires the farm-to-table sensibilities of fellow Austin eateries Dai Due, Lenoir and L’Oca d’Oro. Heard recommends composting and gardening for families interested in reducing food waste, as well as efficient home-cooking habits. She uses leftover bones and vegetable trimmings for stocks, and later even purees the boiled veggies into a flavorful paste for sauces and soups. Chef Sarah Heard offers her creative uses for ingredients often otherwise tossed. • mushroom stems: “Dehydrate [them]to create a flavor-bomb powder.